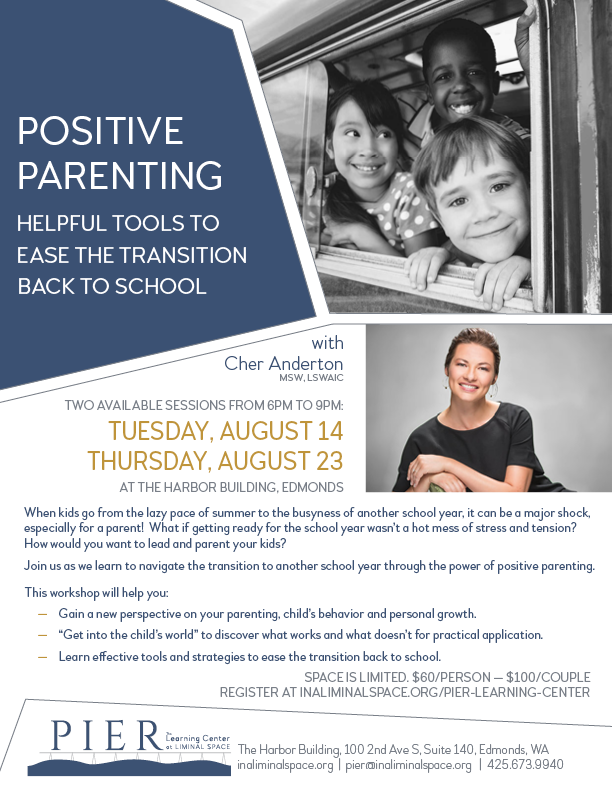 Shoreline resident, school counselor, and private mental health therapist Cher Anderton has scheduled two events on August 14 and 23, 2018 to support parents and families. As a parent, it’s easy to get overwhelmed by the the transition to another school year. We can forget that what matters most is raising kids with traits like a sense of humor, self-reliance, kindness, empathy, hard working and problem solving. Many of us may not feel as though we have the tools and skills to model and teach these traits to our kids. Perhaps this is because we didn’t have positive parenting models as we grew up, we experienced trauma as a child or as an adult, or we are experiencing a lot of stress and have little energy to put towards our children and/or we may have a child with needs that are stretching us to the max! Whatever the reason is for you to want/need more parenting tools in your toolbelt, this workshop will support you in your parenting adventure during this hectic time of returning to school.